These green shoots are the buds of garlic and grow out of the bulbs. They are trimmed in late June and early July so the plants resources can be diverted to growing the bulb itself. The scapes are edible and have a milder but still pungent garlic flavor. They can be chopped up and used in place of garlic, or lightly cooked and eaten as you would any other vegetable. It’s worth grabbing a bunch if you run across some. They are so versatile, delicious, and even if you don’t have an immediate plan (which I mean, now you do with this recipe!) they last for at least a couple of weeks or even a month in the fridge. Personally, I can’t not buy garlic scapes if I run into them, and this bunch was my first of the season! With them, I wanted to create a dish that used layers of garlicky scape flavor. And so, this garlic pesto alfredo was born and perfectly complemented with grilled and chopped garlic scapes. The alfredo sauce is essentially your basic creamy cashew sauce. It’s richness comes from cashews, soaked until soft and then blended until silky smooth. Onion is another one of my favorite ingredients to add to a creamy cashew pasta sauce. It adds a sweetness and some mellow depth of flavor. Sometimes I’ll add it in the form of a dried and powdered spice, but this time I cook it to soften but not caramelize (thereby keeping a whiter sauce). A little nutritional yeast adds some cheesy flavor to the sauce as always, and we couldn’t not have a bit of garlic! White pepper has a pure peppery taste and keeps the clean look of the sauce, which I know is a little silly because we’re about to add pesto to it, but, ya know. And lemon juice adds the much needed acidity and freshness to the sauce, perfectly balancing all the flavors. Next we have our pesto, which is mostly a standard basil pesto, with a simple substitution of garlic scapes instead of garlic cloves. A lot of garlic scape pestos call for a high scape:basil ratio, or sometimes no basil at all! Which is fine, but those pestos are very pungent and often call for freezing for at least a month or so to mellow the flavors. 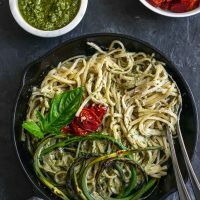 With a creamy alfredo and a flavor-packed pesto this recipe was already getting awesome, but I wanted to take the garlic scapes to the next level. So, I grilled them (on my indoor grill pan, a skillet or outdoor grill would also work well)! Cooking garlic scapes tempers their flavor, and they go from very pungent to mild and snackable. Cooked, they have an almost asparagus-like texture and you can use them similarly. Here we chop them up and toss them into the pasta for bursts of slightly sweet, mildly garlicky flavor. To balance all these rich and garlicky flavors, I finished the dish off with some oven roasted cherry tomatoes. 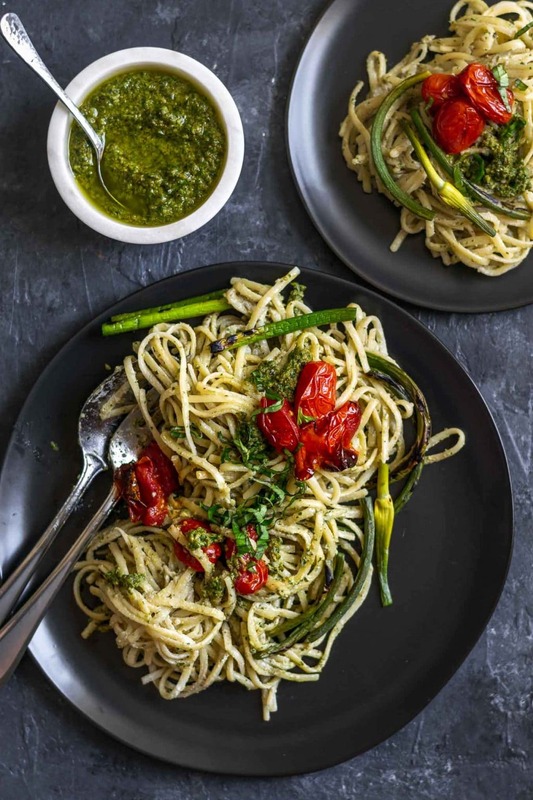 Bursts of sweet and juicy tomatoes complement the garlic pesto alfredo pasta perfectly. The end result is a delicious dish that’s brimming with flavor. There’s a lot of parts going on here, but nothing is overly complicated. You can always prep your pesto in advance, as well as the alfredo sauce. Even the cherry tomatoes will reheat nicely if pre-roasted! Sitting here writing this post I’m getting the itch to run out and get more garlic scapes to make this recipe again ASAP! It’s so delicious, easily made gluten free, and a nice and hearty vegan meal, sure to satisfy any appetite. I really hope you guys like it as much as we did! As always, comment and/or rate the recipe below if you make it and don’t forget to tag your recreations @thecuriouschickpea and #thecuriouschickpea on Instagram! I love seeing photos! 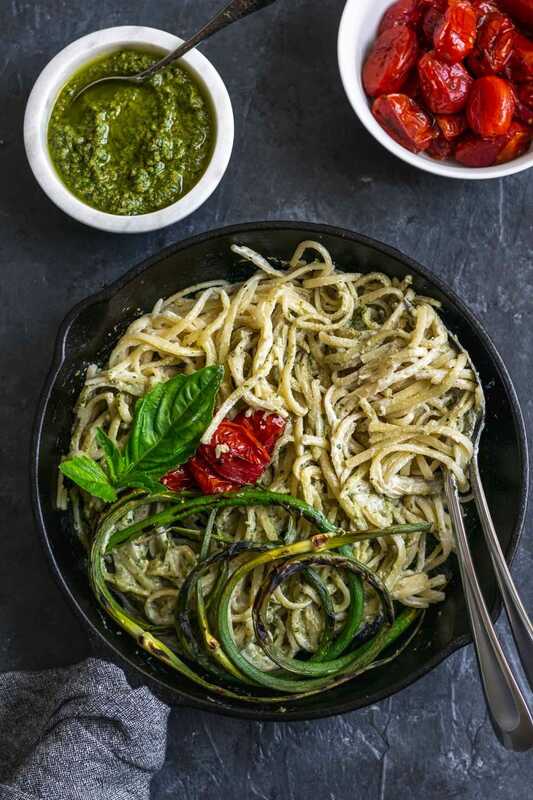 Garlic scape and basil pesto is mixed with a creamy rich tasting alfredo sauce and tossed with freshly cooked pasta. 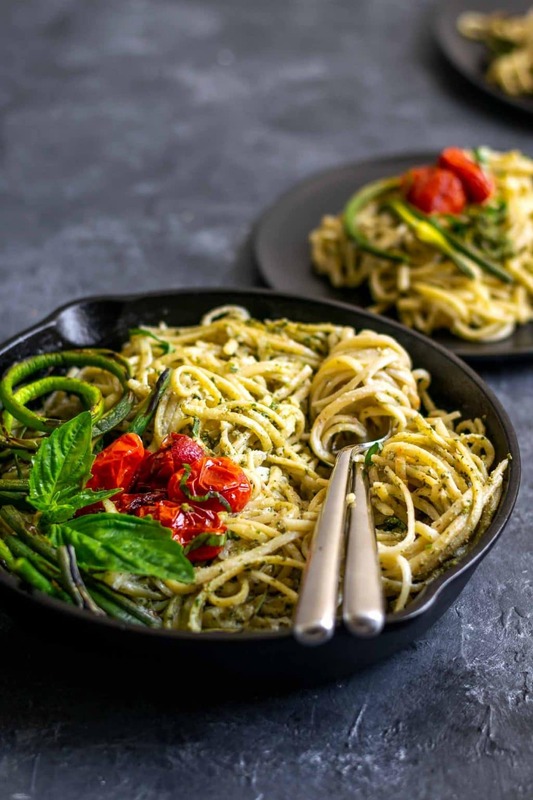 Topped with juicy oven roasted cherry tomatoes and a garnish of basil this hearty pasta dish is the perfect way to enjoy spring produce! Bring a large pot of water to a boil and cook the pasta according to package directions. Drain and set aside. Reserve some pasta water. Roast the cherry tomatoes: preheat the oven to 425 ºF. Toss the cherry tomatoes with the olive oil, salt, and pepper and turn out onto a small rimmed baking sheet. Bake for 20-25 minutes or until the tomatoes have burst, are juicy, and starting to brown or blacken in spots. Make the garlic scape pesto: In a skillet on low heat toast the walnuts for 5 minutes. Add the pine nuts and toast an additional 3-5 minutes until a both nuts are a shade darker and toasty smelling. Transfer the nuts to a food processor and add the nutritional yeast. Pulse until the nuts are finely ground. Add the garlic scapes, basil, thyme, salt, and pepper and process until the basil and scapes are finely chopped. Drizzle in the olive oil and process until your desired amount of creamy. Add the lemon juice and pulse to combine. Taste and adjust seasonings if desired. Makes a scant 1 1/4 cups pesto. Make the alfredo: heat a heavy bottomed pot over medium low and add the teaspoon of oil and chopped onion. Cover the pot and cook for 8-10 minutes or until the onion is soft. If the onion starts to brown lower the heat and add a splash of water. Transfer the cooked onions to a blender along with the soaked cashews and 2 cups of water. Blend until smooth and creamy, then add the nutritional yeast, garlic, salt, pepper, and lemon juice and blend until smooth. Pour the alfredo sauce back into the pot and bring to a low boil. Turn the heat down and let the sauce simmer for 3-5 minutes or until thick. Stir to prevent clumping and keep the bottom from burning. 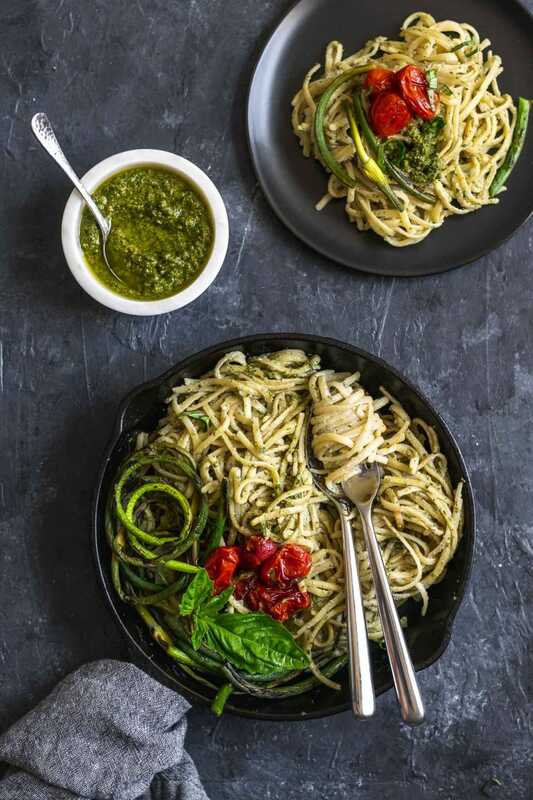 Turn off the heat and mix in 1/2 - 3/4 cups of garlic scape pesto into the alfredo to taste. Cover the pot and set aside until the pasta is ready. Make the grilled garlic scapes: Heat a grill pan or skillet over medium high heat and lightly grease. Grill or fry the scapes, flipping occasionally, until charred in spots and tender about 8-10 minutes. Chop the scapes into ~2" pieces. Serve: Toss the pasta with the alfredo sauce, thinning out with reserved pasta cooking water as needed. 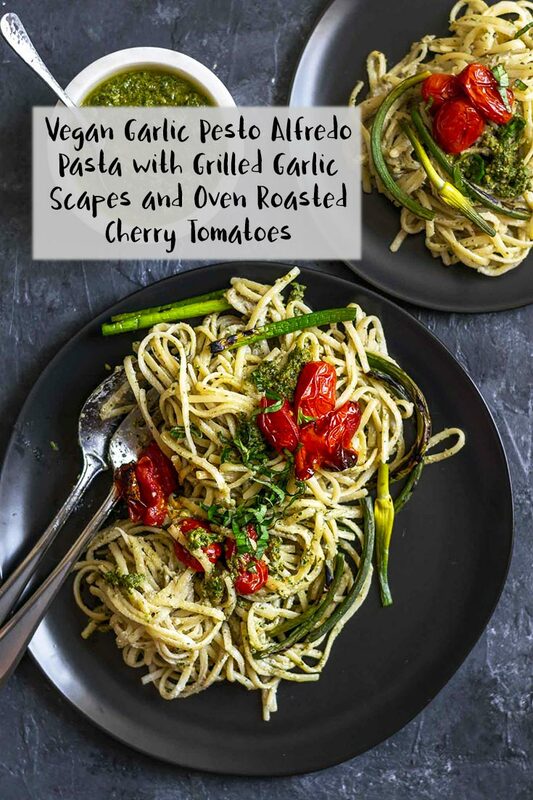 Top with extra pesto, oven roasted cherry tomatoes, and the chopped garlic scapes. Enjoy!